16,1 x 12,5 cm - 6 5/16 x 4 7/8 in. Ambroise Vollard, Paris - Durand-Ruel & Cie. , Paris - Dikran Khan Kelekian, New York/Paris - Mme Maurice Newton, New York - Vente Parke Bernet, New York, 1er novembre 1978, n° 14 (repr.) - Shigeki Kameyama, Tokyo - Ann et Gordon Getty - Vente Sotheby's, New York, 22 octobre 1980, n° 48 - Collection particulière. New York, Museum of Modern Art, 2016, n° 89, repr. p. 145. 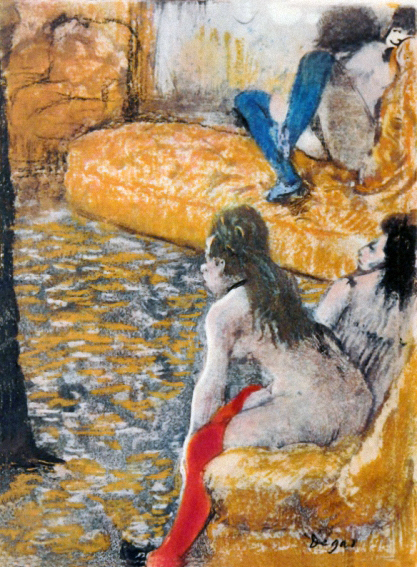 Louïs, Mimes et courtisanes de Lucien, 1935, repr. face p. 10 - Janis, 1968, n° 84 - Adhémar, Cachin, 1973, p. 281 - Brame, Reff, 1984, n° 80, repr. p. 87 - Boston, Paris, 2011-2012, fig. 78, repr. p. 75.